Journalism Tips: Working in journalism. 46. 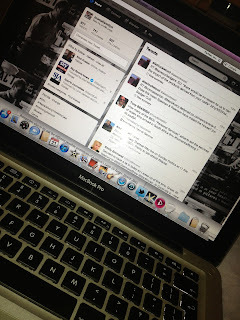 Finding people: Using Twitter. So far social media has not played much of a part in these posts. But it can't be ignored and so to state the bloody obvious - it is now very important... although probably not quite as much as it thinks. So to Twitter. It's a useful resource - and one that no reporter should be without these days. If you know the name of the person than it is obvious. But, as with many of you, not everyone uses their real name. Hence we go back to our information trawl - Did they have any nicknames? What were the names of their friends? - that we looked at earlier. The more unusual the name the easier it is. If the person we are searching for is John Smith clearly it's not going to be an easy task. But what if we know they have a friend Eamon Starbrook - that is a useful first starting point. Check them first and run through their follows/followers. It is possible that among them will be the John we are looking for. Remember also to try out the different possible combitions of a person's name (ie James, Jimmy, Jim). Read through the old Tweets. Small clues can be found. A mention of a particular shop may give you some idea of the area they live in - in other words narrowing down your search location all the time. It does not matter how irrelevant the information may appear at first, what we are doing is building up a picture of the person's life. Now it is very hit and miss whether people are actually on Twitter, many are not and many accounts remain idle. Again you should be cross-referencing all the time. Look for other accounts that are linked, look for husbands, wifes, mothers, fathers, brothers, bosses, colleagues. All produce different answers but all are talking about the same place. If there has been a death try both Rip and R.I.P plus whatever other information you may have garnered from sources elsewhere. Certainly using these techniques we were able to track down a name for the man shot by police which was to later spark the London - and later national - riots that swept the major cities of England in 2011. Now Twitter also has an Advanced Search page which allows you to narrow your terms of reference to within 1mile. It's a powerful tool. Having tried it out it does throw up some interesting connections and some not so obvious ones. So is well worth considering. It can also make connections - although this is possible with TweetDeck. This could come in handy as your own investigations progress and you narrow down your searches. It is worth considering using Topsy too. This will allow you to search tweets up to three years ago - but it is not foolproof and there are gaps. Again using this will help you make connections and perhaps confirm information you may have already picked up from elsewhere. To keep up to date with future tips follow @journalismtips on Twitter or sign up below for email alerts.